Iron Mountain, Mich. (June 19, 2017) — BOSS Snowplow is introducing a unique new skid-steer-based salting system designed to improve contractor profitability, decrease operational costs and improve reaction times to customer service needs.The new QuickCube System utilizes weather-proof, poly cubes (hoppers) that can be filled with solid deicing materials and staged at job sites in advance of wintry weather. The filled cubes will replace the need for remote salt piles, tarps and temporary salt shelters. The cubes can be stacked and are neutrally colored to blend in with existing landscaping. Material is fed to the spinner disc via gravity and the auger for reliability and ease of operation. A fork-shaped spreader assembly is attached to the skidsteer via a universal attachment system and is used to pick up the filled cubes, move them and spread salt. The spreader utilizes the skidsteer’s auxiliary hydraulic couplers, with very few moving parts and no electric motors, making them easier to maintain and reducing the risk of breakdowns. The weldment can be easily removed and exchanged for snowplowing implements like a box plow–giving the QuickCube system even more versatility at job sites. The QuickCube system will allow contractors to expand their service territory in a more cost-efficient manner than a traditional truck and salter combination. Furthermore, contractors will have a simpler time finding seasonal help to operate skidsteers than trucks–as in many cases, a skidsteer does not require a driver’s license (check local laws) and is less expensive to insure. QuickCube was conceived by Nate Kohn, owner of Nate’s Landscape Company in southeastern Wisconsin. Kohn experienced firsthand the challenges in the ice management business. 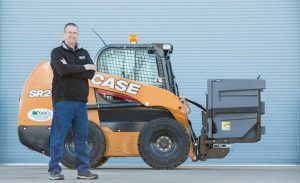 Like every business owner, Kohn’s focus was on improving the bottom line, and he realized that he needed a different set of tools outside of the traditional truck and salter combination to make it happen. After several years of concepting and prototyping, he took the idea to BOSS Snowplow, whose team of engineers listened and helped Kohn design and develop the final product. A QuickCube system consists of a spreader assembly and six poly cubes (hoppers). Each cube holds 1/2 cubic yard of deicing material. A complete QuickCube system has the same capacity as a 3-cubic-yard V-box hopper spreader. Designed with contractor profitability in mind, the QuickCube system is competitively priced and backed by the warranty and durability of the BOSS brand. For more product details, visit www.bossplow.com. BOSS Snowplow is a leader in the snow and ice management business with a growing line of plows for trucks, UTVs, and ATVs, salt and sand spreaders and box plows built for the snow and ice management professional, as well as the homeowner. All products are designed for ease of use, quality and durability. With a market competitive warranty, uncompromising quality and high level of craftsmanship, BOSS has grown to be a leader in the sales of truck mount plows. BOSS products are designed and manufactured in Iron Mountain, Michigan, in an approved ISO 9001:2008 registered facility. BOSS maintains a network of nearly 800 dealers worldwide. For more information on BOSS Snowplow call 800-286-4155 or visit the company’s website at www.bossplow.com. The Toro Company (NYSE: TTC) is a leading worldwide provider of innovative solutions for the outdoor environment including turf, snow and ground engaging equipment, and irrigation and outdoor lighting solutions. With sales of $2.4 billion in fiscal 2016, Toro’s global presence extends to more than 90 countries. Through constant innovation and caring relationships built on trust and integrity, Toro and its family of brands have built a legacy of excellence by helping customers care for golf courses, landscapes, sports fields, public green spaces, commercial and residential properties and agricultural fields. For more information, visit www.thetorocompany.com.